Automatic lead qualification, meaning increased sales productivity. 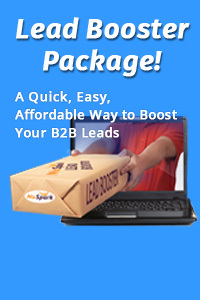 Save time following up on bad leads. Shortening of sales cycles. Nurturing advances prospects through the purchase funnel, increases their lead score, and provides additional sales opportunities. Increases campaign ROI. Nurturing converts leads into opportunities. Define criteria on your ideal prospects and leads. When should they go to sales? What are your content and nurture KPIs to measure? Really understand your buyers. What questions do they ask via each buying phase? How do they make vendor decisions? What is your ideal customer profile? Identify existing content; prepare new content, and determine where each asset fits into the buying phases for each prospect. Plan what information buyers are looking for, and give them answers via your quality content. You can read many blogs on this subject; there’s great thought leadership out there. Many of those blogs and articles discuss the “what,” the “why,” and touch on the “how” but really don’t get into actual planning and implementation of actual nurture campaigns. Put together a basic list of demographics (compiled from lead forms) and content behavior items (compiled from potential email/content engagement behaviors). 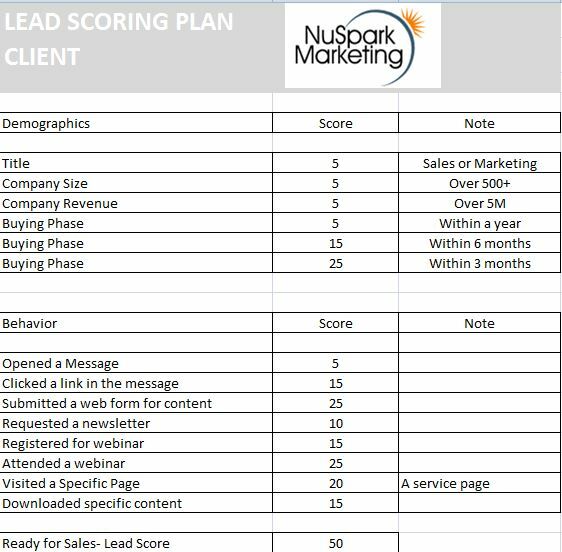 Assign each a score that is agreed upon between sales and marketing teams. Then determine a “threshold” or a score that tells your marketing automation to transfer that lead to sales for further contact, because that lead is assumed to be “actively” engaged with content and may be a valid prospect for a sales opportunity. Below is a sample matrix we use. Gather two databases of available content. One for blogs; the other for longer-form content. As you see from the headings of our matrix, we get granular when we list our available content, whether they are white papers, case studies, ebooks, recorded webinars, or more. We also plan our clients’ blogs on a blog calendar matrix; in order to keep track of our topics so that we can utilize them via our nurturing campaigns or newsletters. For every email campaign, we need to keep track of which email and landing page templates we need to use; which helps us orchestrate the nurture campaigns by aligning the content asset with an email cover, an autoresponder, and a landing page/thank you page (for conversion tracking). We also plan initial landing page or email subject line tests here. Campaign Types. This is where I identify the list that’s identified with a specific lead flow. A Form Submit list is a list of prospects that just enter the top of your funnel via a web form. A Manual List is prospects uploaded from a 3rd party source. A Nurture list is a new lead nurture flow gathered from an existing list of prospects that came from one of the two other two sources just described here. Segment/List. This is where we choose from which specific list or segment of that list we will be planning nurture flows to. Nurture Strategy. This field identifies the nurture flow content strategy- awareness-consideration, decision, loyalty buying phases. How the lead nurturing template works. Drip strategy basics. First, if this is a lead generation campaign, we begin with an autoresponse message, which is emailed immediately after the email submission. We have three Thank you templates, which can be customized. Thank You Content for content downloads, Thank You for Registering for webinars, and Thank You Contact, for direct web form inquiries. These autoresponders are triggered for any of the actions defined above whether at the beginning of a lead generation campaign, or within a nurture lead flow when long form content is distributed. For the first 3 drips of a demand generation campaign, I wait 7 days before next email, then 14 days, then 21 days. For nurture campaigns with the goal to reactivate stale leads, test between 21 and 28 days between emails. Now the fun part begins. After the initial 3 drip campaigns, your content engagement is either going to be positive or negative. Send the prospect to another list, perhaps an accelerated lead score campaign, since the prospect has shown some interest in your content, but not enough to reach your lead score “send to sales” threshold. Add the prospect to a CRM or Salesforce (SF) task, in case you want your sales people to call any prospect that downloads content, for example. Notify. If you want to email a salesperson when a positive occurrence occurs, so he/she is aware of lead activity. If there’s no engagement after the 3 drip emails, you can continue additional drip campaigns another 3 times, or the frequency of your choice. The goal here is to garner a positive response from a prospect. During the lead flow, if a positive action does occur (drip email 5, for example) then the steps taken when a positive action begins (as above). This section of the matrix provides your campaign actions when your lead score threshold is reached any time during the lead flow drip campaign. We also include instructions for what happens to lead when the lead flow drip campaign ends. Lead score threshold reached. Follow the options listed above under Positive Actions. This will most likely be send to a Salesforce Task and Campaign. You can also send the lead (now an opportunity) to a loyalty list (reserved for leads that sell, and gives an opportunity to send newsletters and upsell/cross sell messages). When Drip ends. When the specific drip campaign ends, that lead either moves to another drip campaign or list (positive or negative actions) or another option if the lead is negative; removing that lead altogether from your lists, because you determine after the initial drip campaign flow and the additional reactivate flow that the prospect is not a prospect at all. Remember, a positive lead is one who has engaged in content, but hasn’t reached the lead score threshold yet. Proper lead nurturing planning is a key to a successful campaign. 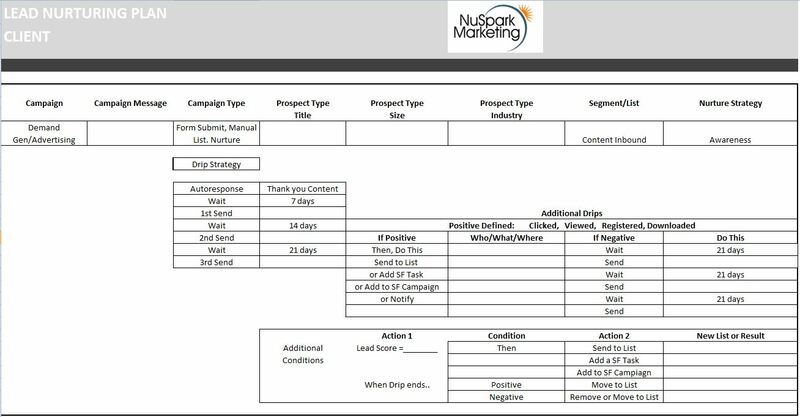 By using these templates, you have the tools to plan when content should be sent to each prospect and when, minimizing any guessing, and being strategic instead. What do you think of my approach? What is your lead nurturing planning process? Awesome info. Looking to incorporate drip / email nurturing into my website https://megaleads.com. Getting inline for marketing automation and lead scoring. Great information! Thank you for taking the time to share in such detail!